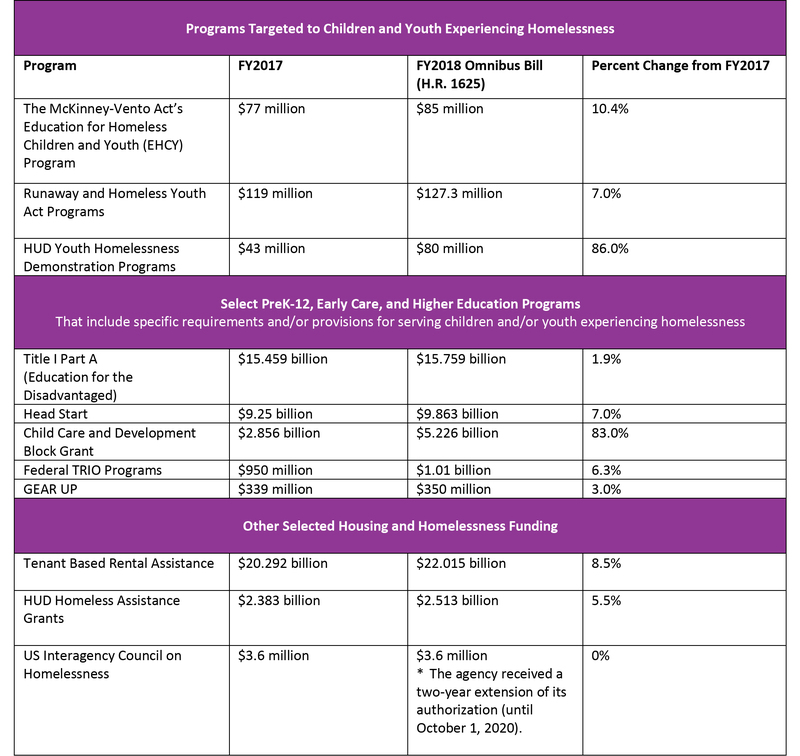 The recently enacted FY2018 omnibus legislation – the Consolidated Appropriations Act of 2018 – includes historic increases for programs serving homeless children and youth, including an increase of over 10% for the McKinney-Vento Act’s Education for Homeless Children and Youth program, and a 7% increase in funding for the Runaway and Homeless Youth Act program. The Act also includes a tremendous boost in funding for the Child Care and Development Block Grant – an 83% increase to $5.2 billion – and a 7% increase in funding for Head Start. These programs contain specific requirements for identification, outreach, enrollment, and prioritization for families experiencing homelessness. Higher education programs, too, received increases in the FY18 bill, including both TRIO and GEAR UP programs. The chart below provides more details. Now that the FY2018 budget has been signed into law, Congress will turn its attention to the FY2019 budget. We urge readers to communicate with your U.S. Senators and U.S. Representative in support of the only two federal programs specifically targeted to supporting homeless children and youth – the McKinney-Vento Act’s Education for Homeless Children and Youth program (EHCY) and the Runaway and Homeless Youth Act (RHYA) programs. Please consider meeting with your Members of Congress, or their staff, when they are back in the district. If you’d like advice on setting up a meeting, please contact us, and we’ll be happy to help. If a meeting isn’t possible, please consider sending a letter and getting as many community members as possible to sign it. We’ve created a sample letter in Microsoft Word. Download the letter, edit it, and send one version to your U.S. Representative, and one version to both of your U.S. Senators. Finally, we’ll be co-hosting a webinar with the National Network for Youth on April 10 to review the FY18 budget outcome, FY19 budget prospects, and other legislation related to homeless children and youth. Please register here.